Round 1: Acosta lands a solid right. Antillon puts on the pressure. Antillon looks very strong for 135 lbs. Acosta lands a right uppercut and is moving well. Antillon lands a left hook to the head. Round 2: Antillon lands a right to the body. He is throwing good body punches. Acosta throws a flurry to Antillon's head. Antillon throws a left hook to Acosta's head, but Acosta slips the punch. Round 3: Antillon jabs to the body and then fires a right to the body. Antillon is a strong puncher and lands a right uppercut. Acosta lands an overhand right. Antillon lands a straight right. Round 4: Acosta lands another right uppercut. Antillon is the aggressor and is trying to impose his will. Acosta is boxing well and landing solid , clean punches. Round 5: An overhand right dazes Antillon. Acosta starts to work the body. Antillon is still coming forward landing body shots. Round 6: Antillon continues coming forward and throws his jab. Acosta hits Antillon with an overhand right followed by a right uppercut. Round 7: Antillon lands some hooks. Toward the end of the round, Acosta is boxing and beating Antillon to the punch. Antillon lands a left hook to the body. Round 8: Antillon is relentlessly coming forward and lands a left hook to the head. Antillon hits Acosta with a solid right inside. Antillon has a cut above his right eye. Round 9: Acosta lands some body shots and an overhand right. Antillon goes to the body - hits Acosta with a right to the head. Acosta nails Antillon with an overhand right. Acosta catches Antillon with a stinging right uppercut that floors him as he came forward. The referee stopped the bout when Antillon got back to his feet. Overall Summary: Miguel Acosta is a much better fighter than his record indictates (26-3-2, 20 KO's ). The 31 year old Venezuelan landed quick uppercuts and used his range well. Acosta did not engage in a slugfest with the hard punching 26 year old Urbano Antillon, who suffered his first professional defeat (26-1, 19 KO's). Throughout the fight, Antillon kept the pressure on, but did not land the cleaner punches. Antillon landed some good body shots, but Acosta was landing crisp uppercuts as Antillon was coming toward him. Antillon suffered a cut above his right eye in the bout, which probably was the result of an uppercut from Acosta. 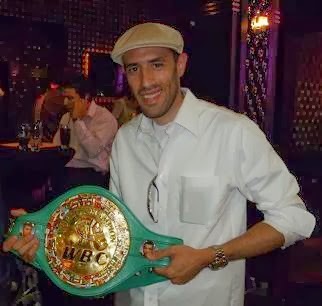 Miguel Acosta has not suffered a defeat since October 18, 2003. His record from that point on is (17-0, 12 KO's).